A hit and run auto collision occurs when a motorist causes or contributes to a collision (to a fixture, person or other vehicle) and fails to stop and give his/her name. In the early days, hit and run drivers that fled the scene of a collision were almost impossible to identify because there were no license plates, drivers typically wore goggles, which obstructed their appearance, and unpaved roads created dust that hindered the vision of the victim. However, nowadays--and almost uniformly across the United States--a driver that flees the scene of a collision and fails to stop and identify himself is a violation of the law. In Georgia, the conduct of a hit and run driver who fails to stop and provide identifying information is a crime under O.C.G.A. 40-6-270. Under Georgia law, a motorist that causes injury to or the death of another person, or property damage to a vehicle, is under the following obligations: 1) stop or immediately return to the scene and identify himself providing the registration information of his/her vehicle; 2) provide his driver’s license information upon the request of a victim or other motorist; 3) render aid and transportation (or arrange transportation) if it is obvious that transportation is required for treatment or the victim requests transportation; and 4) contact EMS and police if the victim is deceased, unconscious or unable to communicate. If the accident causes serious injury or death and the motorist fails to stop, then the motorist may be found guilty of a felony and imprisoned for one to five years. If the injury is not serious and causes property damage, then the crime is considered a misdemeanor. In addition to criminal charges, a motorist guilty of fleeing the scene of a crash may also be subject to punitive damages in any subsequent civil action by the injured victim. Under Georgia case law, the conduct of a hit and run driver who fails to provide his/her name and render assistance to the victim may authorize the jury to find that the conduct of the driver exhibited an entire want of care and conscious indifference to consequences and warrant recovery of punitive damages. Battle v. Kilcrease, 54. Ga. App. 808, 810, 189 S.E. 573 (1936); Keenan v. Hill, 190 Ga. App. 108, 109, 378 S.E. 2d (1989). It is important to utilize the services of an experienced personal injury attorney to maximize your opportunity to receive a punitive damage award at trial. Often, hit and run drivers are fleeing the scene of a crash because they are under the influence of alcohol or drugs and do not want to be arrested and punished for their crime. Typically, if the victim does not have the ability to record the license plate of the offending motorist, it is almost impossible to identify the hit and run driver at a later point in time in order to receive compensation for your property damage and pain and suffering. Important evidence can be lost or destroyed over time and witnesses and victims can forget crucial details. 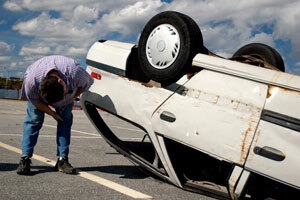 Plus, culpable parties can repair their damaged vehicles. As such, it is crucial that you contact an attorney immediately. An experienced auto crash attorney who is familiar with hit and run accidents can gather relevant evidence and information, and work to track down the hit-and-run driver. In these cases, it is difficult if not impossible to recover from the fleeing unidentified motorist. However, in some instances recovery may still be available. An experienced Georgia car collision attorney can work with you to recover money from the applicable uninsured motorist carrier for the damage caused by the hit and run driver. The Law Offices of Kevin C. Ford have twenty years of experience in handling the claims of Georgia hit and run accident victims, and if you or your loved ones have been the victims of a hit and run accident in Georgia, we can help you, too. Contact us today, to speak to an attorney right away. As always, the consultation is free, and there is no obligation. Call us, or use the online form. We are available to answer all your questions.